The Darkness II is a dark and moody graphic novel style first person shooter with a very unique battle system, an interesting linear storyline but some fairly cliché characters. It’s dark atmospheric environments look great. 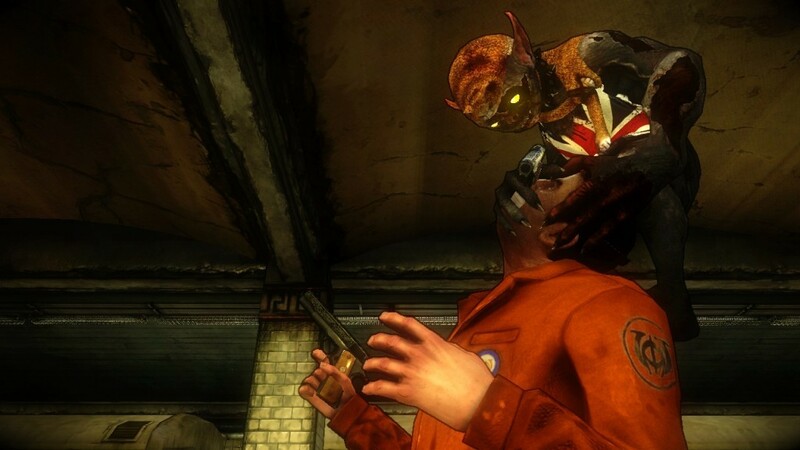 The Darkness II utilizes a stylized cell shading effect that takes it’s cue from Borderlands but uses less cartoonishly proportioned models (If you don’t count the prostitutes operating out of that disused Mannequin Warehouse …creepy). You play as young mob Don, Jackie Estacado, who is possessed by the titular “Darkness” an entity of pure evil who lives inside it’s host granting them phenomenal abilities but at the cost of their humanity and perhaps even their sanity. The game opens with a violent attempt on Jackie’s life at this own restaurant. A strange cult which you will later discover is lazily called “The Brotherhood” wants the Darkness for it’s own nefarious ends and will stop at nothing to get at it. 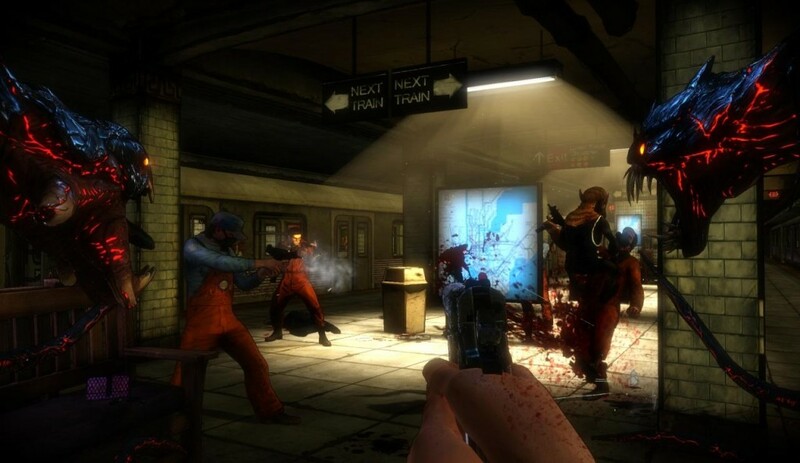 For the most part, The Darkness II’s gameplay is similar to countless other first person shooters. You can shoot, reload, sprint and crouch. But what sets this game apart are the two demonic snake-like creatures called “Demon Arms” that are perched on each of your shoulders. The left Demon Arm, lets call him “Lenny”, can be used to grab objects or enemies in the world and the right one, “George”, can be used to perform wide sweeping melee attacks and also assists with the brutal “Executions” that become the cornerstone of your survival during your playthrough. When you combine the utility of “George and “Lenny” with the ability to wield two different weapons simultaneously and fire them independently it gives you a complex set of tools to create some truly manic action. Early in the game you also gain a companion. A fowl mouthed imp wearing an over-sized British flag jersey. It refers to you mockingly only as “Monkey” and assists with directing the player by automatically moving towards the next area once a set piece gunfight is over. The creature’s primary job is to distract enemies during combat by forcing them to focus fire on him or by leaping onto them making them vulnerable to be snatched up by “Lenny”. The imp will take every available opportunity during play to fart and urinate on dead enemies in a pretty low brow attempt by the developers to get a chuckle out of the player. It’s not an entirely dis-likable character but it’s toilet humor didn’t really work for me. 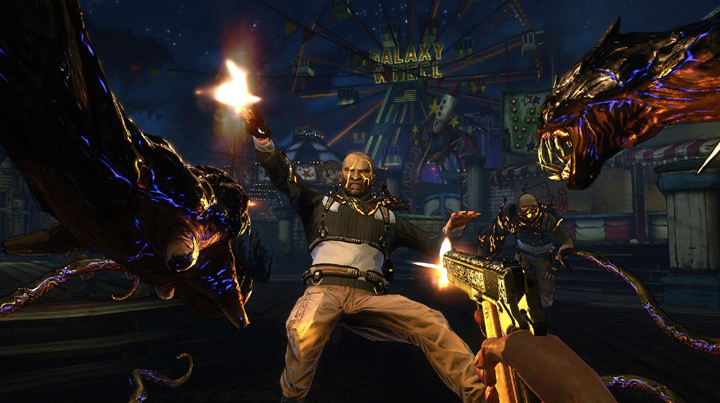 The Darkness II does not feature a health regeneration system. This means when you get hit and your view is blood spattered and wavering your in real trouble and can’t expect to survive unless you quickly find a way to replenish yourself. Their are two ways to regain your health. The first is to let your left Demon Arm, “Lenny” lash out and consume the hearts of fallen foes by pressing the Use Key when looking at the tell-tale purple hearts visible through a dead enemies’ chest. The second, and more effective way is by performing an “Execution”. When enemies are vulnerable to being grabbed you will see a golden glow eminating from them, you can then lift them off the ground and perform a number of different types of Executions, depending upon how far into the upgrade tree you have gotten. Executions come in a few varieties and each has a different effect but all are extremely violent employing copious amounts of spraying blood and gory dismemberment. Though nothing that Mortal Kombat hasn’t already desensitized us to . By tearing an opponent limb from limb you will be able to regenerate health, replenish some of your ammunition, decrease the cool down of tertiary abilities or generate a protective barrier for a short period of time. During a fire fight your constantly monitoring your surroundings for opportunities. You can tear a car doors off it’s hinges to use as a shield, grab loose rebar or pool cues to use as javelins and even use the enemies themselves as projectiles. The Darkness inhabiting Jackie gives him an enourmous edge in combat, but as with most overpowered abilities there is an Achilles Heel. Like Superman to Kryponite or the Green Lantern to… the color Yellow, The Darkness shrieks and retreats when caught in the light. Each time you enter the cone of light cast by a light source your Demon Arms vanish, your ears begin to ring and your field of view becomes washed in blinding light. By shooting out lamps and other light fixtures you can eliminate the areas where you would find yourself vulnerable. However some light source are protected and require you to follow a cord back to it’s generator and destroy it. The Darkness shrieks and retreats when caught in the light. This creates an interesting dichotomy in gameplay as you play you’ll be wiping out foes left and right, firing your dual Uzis and throwing a car door at your foe and then with one misstep you find yourself partially deaf and blind and without the ability to grab foes or regenerate health. You go from an nigh unstoppable killing force to as vulnerable as a lamb all because you wandered under a 60 watt bulb. This becomes an especially serious threat later in the game when some of the enemies are equipped with high intensity flashlights that purges the Darkness and forces you to rely on only your hand weapons. The Darkness II features a pretty straightforward but effective unlockable ability system. Between battles you will come accross ominous purple rifts which give you access to an upgrade wheel interface. Jackie can unlock abilities using the “Essence” (Experience) he’s accumulated from dispatching foes in clever ways. Each ability if utilized in game can be tremendously useful. You can learn to “channel” the Darkness into your guns and fire off extra powerful shots without expending any ammunition, useful when your clip is already empty but that foe just won’t go down. Another ability allows you to unleash a swarm of insects to temporarily stun opponents and yet another allows you to knock an enemy into the air and freeze them in place for a few moments making them vulnerable to your fire. The protagonist, Jackie, is the leader of an Italian crime syndicate. 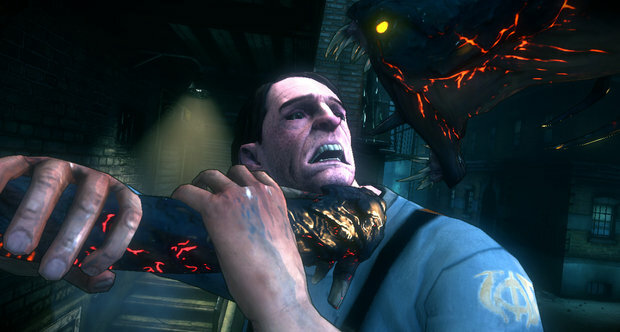 The weakest part of The Darkness 2 for me was it’s cliché portrayal of the Mafia. His mobster friends never attempt to break out of the narrow character parameters established by films such as Good Fellas, the Godfather or Casino. Their womanizers, but the woman seem to love them for it. Their murderers but the most important thing to them is familial harmony. It’s a shame they didn’t stray far from stereotypes because the voice acting is excellent and “Organized Crime meets The Supernatural” is a concept that looks awesome on paper but as executed came off as a Sopranos knockoff with demonic possession thrown in. 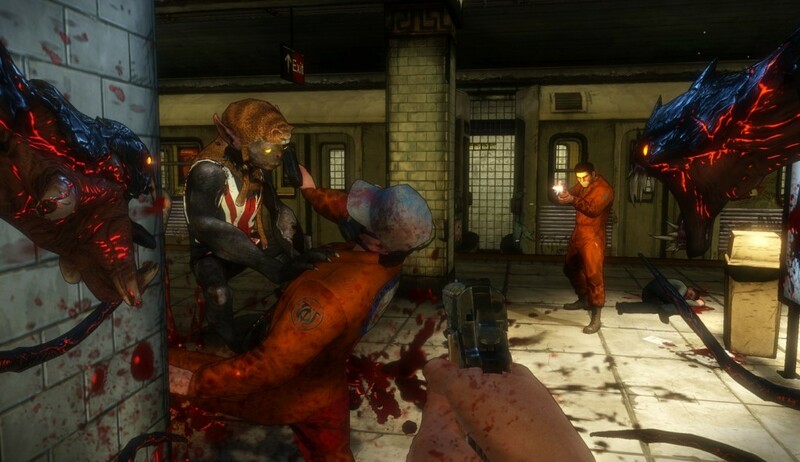 The Darkness II has very satisfying combat and an interesting if not contrived story. My only real complaint about the game is it’s length. It’s too short. I finished the game in two sittings and by the end I hadn’t even maxed out a single one of my upgrade paths. It’s a shame that it was so short, because the game ends at about the time when you’ve finally become comfortable with the plethora of tactics at your disposal. However, the disheartening Day One “Downloadable Content” option on the Main Menu tells me that they will be releasing bite sized morsels for the foreseeable future. Why so high? Looks great, plays great, a welcome departure from the typical FPS storyline. Why so low? Too short, mostly shallow characters, built for DLC, throwing objects at enemies feels clumsy and doesn’t feel as impactful as say emptying your clip into their facial region.